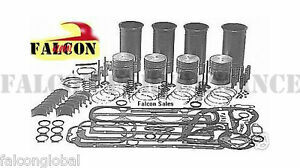 falconglobal has no other items for sale. Sales tax may apply when shipping to: AL(10.0%), FL(8.5%), GA*(7.0%), IA*, LA(9.95%), MN*, MS*(8.0%), TN(9.25%), WA*. We ask buyers to specify piston, piston ring, rod bearing, and main bearing sizes in the "notes to seller" section of the PayPal payment or through a separate email. We must have these confirmed sizes before we can process your order. To make a credit card payment, feel free to contact us toll-free (within USA and Canada) at 800-756-1114 or (outside USA and Canada) at 601-693-8282, EXT. 166 Monday-Friday 8am-6pm Eastern. We do not alter value of parts for duty charges. Please do not ask. Thanks!